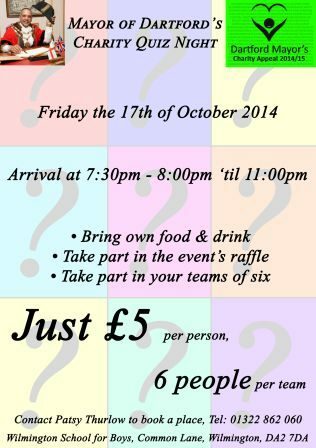 On Friday the 17th of October 2014, the Mayor of Dartford Avtar Sandhu MBE will be holding a charity quiz Charity Quiz Night night at the Wilmington School for Boys in Common Lane, Dartford. The aim of this event and the many others that have been planned by the Mayor and his teams is to raise funding for his charity appeal, which is overall helping 31 charities and groups with aims to help those primarily within the local area to Dartford. The quiz night will include a raffle draw consisting of multiple prizes, and participants of the event will take part in the quiz among teams of six. Partakers in the event will be bringing their own food and drink to enjoy at the quiz night, for details concerning the purchase of tickets and any other basic details for the event, see below.